Maruyama's tow-behind sprayer is powerful and long-lasting — Perfect for those big chemical spray jobs. Maruyama's pump has the unsurpassed 5-Year Commercial Warranty. * Maruyama's superior quality duplex piston pumps deliver remarkable performance and extreme durability. 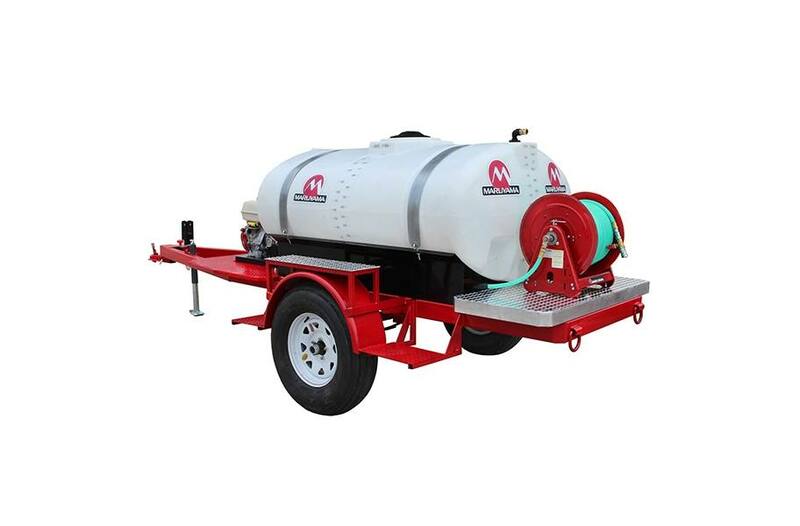 * Maneuverable trailer with secure mounts for the pump, engine and tank properties. * Thick-walled, lockable, durable, sturdy tanks in sizes ranging from 325 to 525 gallons available. * A variety of optional nozzles, nozzle plates, wands, guns, extensions, hoses and booms are available. * See your dealer for a quote for custom trailer configuration.